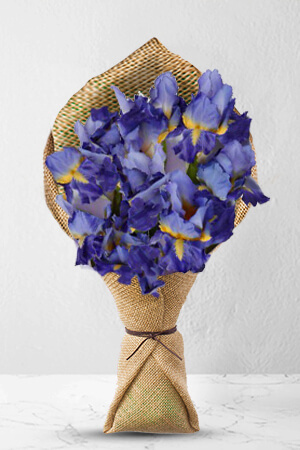 Zaria is intoxicating in both its simplicity and its beauty, with six bountiful stems of rich blue Iris. This will brighten the day of anyone, but is the got to choice for those that appreciate the incredible beauty and unique qualities of Iris.Our bouquets do not include a vase. However, for a bigger impression we recommend a Standard vase, which is an ideal selection for this gift. Prompt reliable delivery and true to beautiful flowers. The blooms were delivered on time, they were described by the recipient as "beautiful flowers", they were competitively priced: ten out of ten! All good. Delivered on time without any issues. Easy to order delivered promptly.